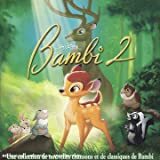 The healing of a heart – Paroles de la chanson dans “Bambi 2”. The healing of a heart. With the healing of a heart. The soils rich and dark. There’s a clear running stream. And the past fades away. With the melting of snow. With the healing of just one heart. And with the healing of a heart. The whole world springs anew. Sweet as the words I love ya. It’s just a word to sing. I’ve been waiting, I’ve been waiting. For a brand new day.